Art for All of Us? Greek tragedy and war veterans. I need to start this review with two disclosures. 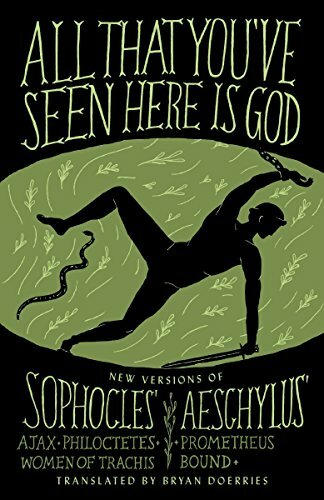 First, I'm a competitor of Bryan Doerries, as I have my own translations of Greek tragedies (though not any of the four that Doerries translates in All That You've Seen Here Is God) coming out any month now. 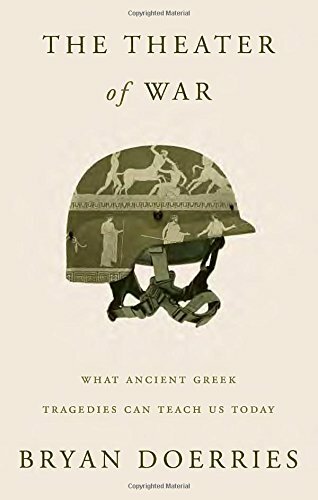 Secondly, even if I were differently positioned as a fellow translator of ancient literature (say, if I had worked only on epic), I'd still be unqualified to review—not these books themselves, but what actually needs reviewing, the whole Theater of War project, the heart of which is performances for the benefit of veterans (though the project has spun off performances for other troubled groups, and even a Book of Job for disaster victims). My career is very different: it's about desk-bound translation, and its main premise is the creepy relationships I develop in my head with the original authors—my parents having neglected to explain to me the difference between love and stalking. But I'm going ahead with my assessment because, after hassling the editor of this journal with doubts and grousing, and the author of the books under review with demands for an interview and an opportunity to see a live performance, I watched some video and had to conclude that it largely speaks for itself. If I'm going to claim that my cause is translation reform, I must offer Doerries congratulations and encouragement for his fine contribution to that cause. Doerries, with his own loose, clear, and succinct translations, and with readings by superb actors, has re-created several essentials of Greek tragedy for our time. Paul Giamatti—perhaps most familiar as John Adams in the television miniseries of that name—is to my mind the greatest living dramatic Everyman. He is flawless as Sophocles' Philoctetes, the warrior the Greeks carelessly abandon on the way to Troy because of his infected snakebite but cynically try to retrieve nine years later in order to exploit his magic bow for the city's defeat. As his wound spasms, he shrieks, spittle gathering on his lips, describes the agony, begs for help. But it can't of course be a naturalistic speech, the imitation of a scene at a trauma ward: it's controlled, perfectly timed, a work of art. Doerries, for his part, is plainly a born director. In Theater of War, he describes his first translation production, of Euripides' Bacchants at Kenyon College as an undergraduate: his use of a low-riding Buick Skylark as a machina to bring on the wine god Dionysus and his band of ecstatic followers, "bouncing in the back seat to the bump and thrum of low bass tones"; and his retrieval of the production from disaster after his Dionysus got stoned and locked his keys in the car. As a translator, Doerries has overcome some of the signature conundrums of moving 5th-century BC Athenian poetry into modern English. The interjections are particular knotty: there are different ones for different moods and situations, and there are no authentic equivalents now but expletives—obviously wrong for the genre and offensive to a large part of the audience. But the archaic exclamations "Woe is me!" and "Golly!" and so on just sound dopey to us—they are among hidebound elements Doerries rightly deplores, recalling his first participation in tragedy, as a child playing one of Medea's children, with his BVDs showing uproariously under a short tunic at one point. He now credibly uses inarticulate cries and moans for many interjections, and Giamatti and other performers handle them with grisly impressiveness. The translations are quite free, which is necessary for stageability. But it's debatable how far beyond mere clarity it's right for a translator to go. The use of anachronisms tends to be a good test case. Are there enough to smooth the story along intelligibly for a modern audience, preventing the distraction of either confusion or pedantic exegesis? I've witnessed Greek drama almost literally footnoted on stage, and it was annoying. But do the anachronisms themselves stick out and distract? In Doerries they sometimes do and sometimes don't. "Shell-shocked" in the Ajax translation is passable (if rather tendentious—see below), as in common usage it's no longer a medical term but just describes a state of mind. But "body bags" in the same play—no way; those are objects that didn't exist, and they represent a whole regimen of death that didn't either. Still, bobbles like this aren't ruinous, as Doerries has managed the whole administrative and fundraising and directing business to bring about truly professional productions, even though they're mere seated readings. Giamatti can make the word "wretched," as a purportedly spontaneous expression of physical agony, sound natural. Nearly all of Doerries' other casting is both ambitious and spot-on, and his taste and sensitivity as a director is palpable.